As a kid, growing up in Garden City, Long Island, Ketigian loved to tinker in his father’s bike shop. “It was a family business started by my great-grandfather. My dad definitely influenced me with his hands-on mechanical skills. He always encouraged me in my own mechanical tinkering.” All the tinkering, though, laid the groundwork for an interest in engineering.His mother, a nurse, is very practical, systematic and intelligent, which also influenced him—he is at heart a problem-solver. It isn’t a giant leap from the bike shop to the engineering lab. Ketigian is still making things, experimenting in the shop, but now the stakes are higher. SpaceX’s big project is the Falcon 9 launch vehicle, along with the Dragon spacecraft, which will transport supplies to the International Space Station (ISS), and at some point will also transport people. Falcon 9 was first launched in June 2010, and again in December 2010. Ready for Liftoff: the Dragon capsule integrated with the Falcon 9 rocket prior to launch at SpaceX's Cape Canaveral launch facility. Ketigian works as an avionics engineer for SpaceX (the word “avionics” is an amalgamation of “aviation” and “electronics”). In other words, his department is responsible for things like the power and guidance systems of rockets, as well as software, wiring and instrumentation. Specifically, Ketigian is responsible for wire harnessing and integration of the vehicle. Harnessing refers to the wires and cables that connect components throughout the vehicle. Each component must be fully tested and functionally sound; and then, he makes sure that all the individual components in different locations of the rocket are interconnected properly. For Ketigian, this is the perfect environment to work in – it’s a place where theory must have practical, real-world applications. Not to mention that he gets to make things that go into space. “Only a small percentage of engineering projects have the ability to leave this terrestrial body,” he exclaims. Ketigian still thinks about returning to higher education. At some point, he’d like to finish that Masters degree that he started three years ago. 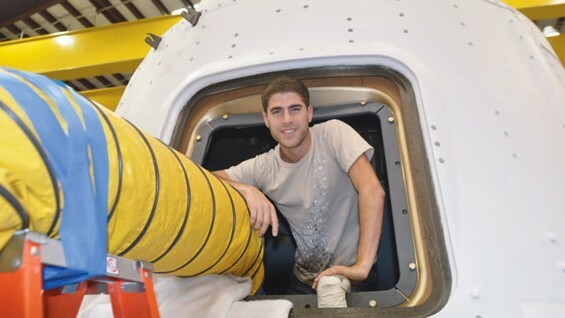 “Though it’s hard to imagine going back to the classroom after working at a place like SpaceX.” On the other hand, having a great deal of exposure to many areas within his field, he now knows exactly what he wants to pursue. And he’d like to pass on his passion for building things to others. In fact, he says he’s thought about teaching at Cooper. “I’d love to teach a Digital Logic class one day at Cooper,” he says. “I know that Cooper only lets in the best and the brightest and it would be great to be able to influence people like that, and share with them what I’ve learned and what I think is really valuable.” Cooper alumni give back in many ways—Ketigian sees teaching as one of those ways. Ketigian was at the historic launch of the Dragon spacecraft on a Falcon 9 rocket, from SpaceX’s Cape Canaveral Air Force Station launch site, on December 8th. He’d flown his father down to see the launch with him. “Seeing it take off,” he says, “was surreal.” “I was in Cape Canaveral supporting mission ops prior to the launch, so I had the opportunity to see the launch live. I had been working night shift, and since the launch was during the day I was able to watch with the naked eye instead of from screens in the control center,” Ketigian recalls. The spacecraft went on to orbit Earth twice, before safely landing a few hours later in the Pacific Ocean. This made SpaceX the first commercial company to recover a spacecraft from orbit, a feat previously achieved by only six nations or government agencies. What was once only the stuff of dreams and science fiction is now rapidly becoming part of the very real and evolving world of space exploration. At this rate of development, the saying ‘the sky’s the limit’ will soon be something of the past.